Trending at $154.98Trending price is based on prices over last 90 days. 73 product ratings - Game Boy Micro 20th Anniversary Famicom Mario Special Edition New in Box! Game Boy micro (Famicom version) ?Manufacturer end of production From Japan? Nintendo (OXY-001) Game Boy Micro, Power Supply & 3 Game Bundle - Super Mario! 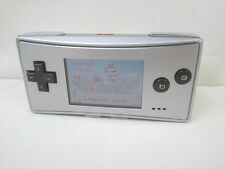 73 product ratings - Nintendo (OXY-001) Game Boy Micro, Power Supply & 3 Game Bundle - Super Mario!